Aditi Rao Hydari launches Avon True Makeup Range in India on Facebook Live! Avon, the women’s beauty brand that has been giving beauty a purpose since its inception, launched its coveted range – Avon True through Facebook live. For the first time, ever, Aditi Rao Hydari, the brand ambassador introduced the range to thousands of consumers by going live via Facebook. Infused with True Color Lock technology, the range promises solutions that offer the exact colour as shown on the palette. Not just this, the line offers uncompromising, ultra-pigmented color that applies effortlessly. The new line contains self-renewing pigments which results in lasting color output and includes mascara, lipsticks, kajal, nail paints, foundation, eye shadow etc. Avon True Digital Launch saw Aditi interact with the audience in a fun and quirky way. She played engaging games like Truth or Dare, and other contests to keep the audience entertained throughout. The Avon True digital launch stirred excitement among the audience and during the FB Live #AvonTrue also trended on twitter. Through this endeavor, Avon India aims to keep the beautiful promises and offer products that are of international standards in a rational price range. Maverick singer-composer Hariharan has come up with his latest love track Haule Haule. The song is presented by T-Series and has been sung by singer Sadhana Jejurikar. Featuring models Niiya Kumar and Nitish Kapoor, Haule Haule is a breezy romantic song which highlights the mystic element in a romantic relationship. The music video was launched in Andheri and a special preview was held for the gathered media. Making of the song was also screened at the launch event. Singer-composer Hariharan was present at the launch event. Akshay Hariharan has worked on the arrangements of the track while Sahil Sultanpuri is the lyricist of the song. The music video is directed by Vivek Gupte. 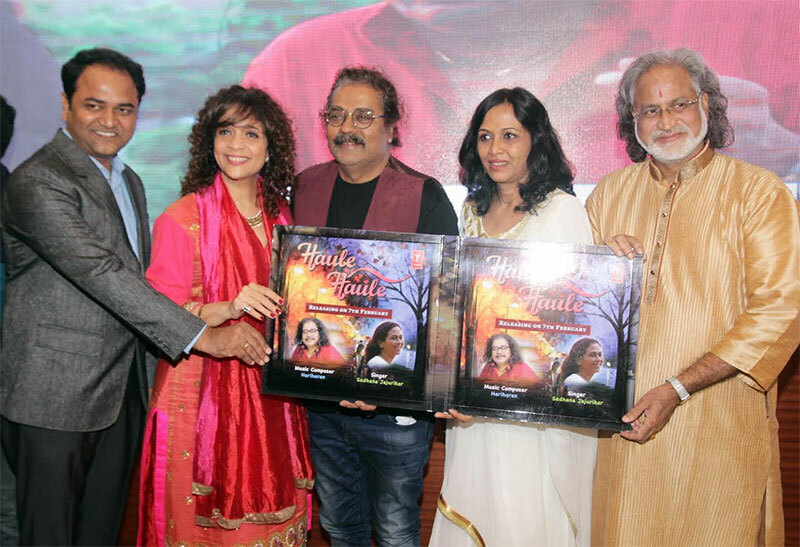 Pandit Vishwa Mohan Bhatt, Ghazal singer Penaz Masani and well-known Marathi actor Ramesh Bhatkar too attended the event. A Ghazal singer by profession, Sadhana Jejurikar has achieved many milestones in her career. The latest being the well-loved album - Duaa (along with Maestro Ghulam Ali Khan). She is also a co-author of a biographical book 'Ghazal Wizard - Ghulam Ali' released by Times Publication. Sadhana has been singing in the Ghazal genre for AIR, Indore since 1992. Sadhana also participated in the musical reality show, Sa Re Ga Ma during the year 1996. She has performed on stage nationally and internationally along with various artists. Sadhana has twice won the Madhya Pradesh Government's Lata Mangeshkar District Award and has been singing with All India Radio since 1994. In 2014, she was also bestowed with the Vikram Award in her home town. She has performed all over India and abroad with many artistes. She has also sung for a few films & music albums in various languages. 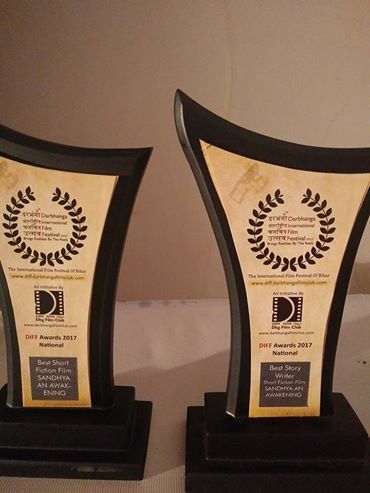 It seemed to be the perfect evening (29th January 2017) for team Sandhya - An Awakening at Lalit Narayan Mithila University, Darbhanga where the 4th edition of the Darbhanga International Film Festival 2017 was being held. The short fiction directed by Mohan Das was not only adjudged the Best Film in the shorts category, but it went to bag the Best Story award too. 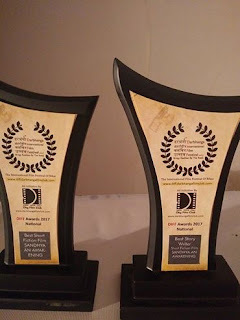 While Sumit Bansala, the producer of the film went on stage to receive the Best Film award, Mohan Das took a bow for the Best Story along with his producer. Sumit Bansala says that Sandhya is an awaited treat in store for all those who love cinema for a cause. “While Indian weddings are a beautiful, soulful affair, filled with ancient traditions and rituals which claim to bond the husband and wife, there are still some traditions that are dated. Keeping up with the times, such wedding traditions and cultures should be done away with as some of these sexist traditions may scar a girl’s mind for life. By showcasing the cause of worry of such sexist traditions, the film will be an inspirational story of how a single girl fights against such societal norms to get herself justice,” added Sumit. The film have been shot at real time locations in Meerut, Mawana, Nangla Jamalpur, Deobandh and other parts of western Uttar Pradesh. Though this story is fictional, it is based on many of the incidents reported in main stream media. Also the central plot of the film is in sync with the recently enforced “Beti Bachao Beti Padhao” movement. Mohan Das adds: “To jolt one out of his or her senses, Sandhya is going to make one think as there is nothing intrinsic linking any religion with any act of violence. Evoking a wide variety of emotions - anger, rage, antipathy, disgust, abhorrence, revulsion as well as anxiety, Sandhya is also an eye opener to those who are willing to fight the system and ban the practice. Her exemplary courage can be a pointer that could change girls' lives in such a polyandry and bride buying society. Sandhya - An Awakening stars Anurag Tomar (Prince), Suren Kakkar, Sumit Bansala, Siddhant Somal, Gourav Chaudhary, Kaavya Kaushik, Anita Pundir, Alpana Mathur, Sandeep, Bittle Rastogi, Suman Somal and Kaushiki Rathore. Based on a story screenplay by Mohan Das & Suren Kakkar, the camera was handled by Dinesh Radhe Shyam Grover, editing by Nakkul Prasad, music by Shankar Dey as well as graphics and vfx by PNP Studios. “With this film, Sumit Uday Films has tried to reach out to people around the world drawing their attention to support the movement of educating every girl child in India to secure a better future”, concludes Sumit Bansala. Weddings in India are not just about two people getting married, it is also the union of two families and many times coming together of two cultures. While Indian weddings are a grand thing, Punjabi & Gujarati shaadis are larger than life, glamorous and a fun affair! Upcoming film Patel Ki Punjabi Shaadi will also explore these two rich cultures however with a sweet ‘n’ naughty clash, the teaser poster of the film reveals. 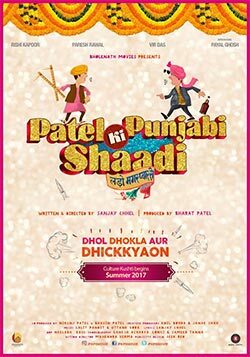 Rishi Kapoor and Paresh Rawal starrer Patel Ki Punjabi Shaadi’s teaser poster is out and promises a lot of fun. The film collaborates two fine actors of Bollywood - Rishi Kapoor and Paresh Rawal, who interestingly belong to two different rich backgrounds in real. Both of them last worked in Damini, almost 24 years back. Vir Das and Payal Ghosh play young lovers while the film also has Prem Chopra, Jinal Belani, Divya Seth, Bharati Achrekar and Tiku Talsania in pivotal roles. 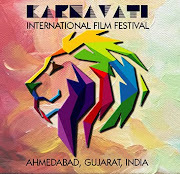 Written and directed by Sanjay Chhel, produced by Bharat Patel of Bholenath Movies, the music of the film is given by Lalit Pandit and Uttank Vora. Pop Star Arjun Kanungo’s Ek Dafaa Video has the cutest chemistry and we are obsessed! You are about to become a huge Arjun Kanungo fan after watching this video. Most of the past few months heart throb Arjun has been teasing his fans with the upcoming song the audio of which was released on Jan 13. Within hours the song was trending on social platforms and fans went crazy. Today, he released the official video for ‘Ek Dafaa’ and we are spell bound. The narrative is about a couples memories and the small moments they experience together that they cherish for a life time. The best part of the video is the suave Arjun Kanungo and how he always manages to impress us. His looks are definitely a thumbs up but this time he also exudes some great acting skills! The video also features the gorgeous Russian model Kseniia who definitely adds the sizzle! The video is exclusively on Dekkho platform for 5 days post which will be available on Sony Music’s YouTube Channel. The overall classy and stylish look of the video will definitely get his fans to watch on loop. Also, we believe if 2017 will be known for anything it would be for this oh so cute song video, watch now! The month of love is here and with its onset, Amazing Thailand brings in some of the distinctive, quirky and one of its kind events & activities for the tourists to indulge in. Make this Valentine’s Day perfect for you and your partner to tie the knot, by opting for the ‘Underwater Wedding Ceremony 2017’. A Thai wedding ceremony of pouring luster water and a marriage registration underwater, is all you need to make your wedding unique and out of the box. The Trang Underwater Wedding Ceremony is scheduled from 12th to 14th February 2017. For the sports lovers & health enthusiasts there is ‘Bangkok Marathon’, one of the popular marathons scheduled for 5th February to unleash and experience the thrills. The route has been planned in such a way that it provides amazing views of the city as runners run towards the river. 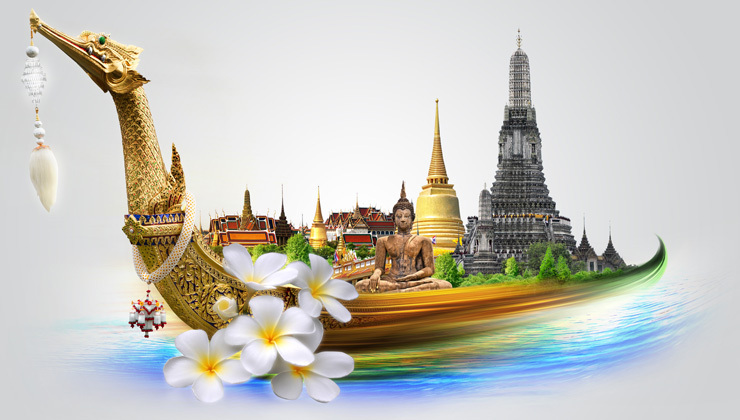 The scenic route takes in many of Bangkok’s historical landmarks and some of the diverse ethnic communities in the city. That’s not all. For the nature lovers, there is 41st Chiang Mai Flower Festival from 3rd – 5th Feb. Living up to the name ‘Rose of the North,’ Chiang Mai organizes the Chiang Mai Flower Festival to showcase its beautiful flowers and decorative plants which are in full bloom towards the end of the winter season in early February. Suan Buak Hat Park is transformed into an open-air exhibition centre where the tourists can find a magnificent tapestry of floral splendor that blankets the land. Orchid lovers should not miss the opportunity to see a variety of beautiful orchids grown by locals. The festival also features flower-decorated floats that parade around the city showing the vibrant colored flowers as well as dancers in traditional costumes. So come to the amazing land of smiles and make the month of love special with your special someone! When A R Rahman and Mani Ratnam get together then the music created is something that will blow your mind! Mani Ratnam’s story highlights the songs and A R Rahman’s songs bring the script to life. And we say this with the release of ‘Azhagiye’ from the film that is so refreshing and new that it brings a smile to your face. A minute teaser that was released on VEVO by the label Sony Music on Wednesday has registered more than a million views already. The song was also released in Telugu as ‘Hamsaro’ from the film titled Cheliyaa. ‘A Minute of Azhagiye’ includes constant clap beats and a gentle loop of guitar strums. Featuring Karthi & the gorgeous Aditi Rao, the video is what love is all about. The track is a hummable romantic duet with a touch of western fusion. "As an actor, I was looking for a subject like Zeenat” Mallika Sherawat ! Mallika Sherawat has been busy with Hollywood projects but now there's a Bollywood film which has excited her. Director Saandesh B. Nayak's Zeenat is all set to be her first Hindi film this year. A social drama, Zeenat focuses on relationships. Saandesh B. Nayak confirms signing Mallika Sherawat and said, "She is extremely co-operative and is super excited about the project." Mallika Sherawat added, "I feel that the script of Zeenat is a subject which is almost in the space of work that I am associated for a while now. As an actor, I was looking for a subject like this. It's fortunate that this is an absolutely commercial Hindi film which helps a message to be conveyed to a larger section of society. I am thrilled and looking forward to this role and working in the film. I have never played something like this before." Zeenat will go on floors soon. The film is a multi-starrer and the other actors will be revealed soon. Zeenat is being directed by Saandesh B Nayak and produced by Isha Nayak under the banner of Saanvi Nayak Films. Valentine’s Day, the most romantic day in the year is around the corner. And while love is a universal emotion, it is expressed differently in different parts of the world. Zindagi is the only channel in India to showcase universal emotions and introduce new cultures to Indian audiences by bringing the best storytelling from across the globe to viewers in Hindi. To encourage its viewers to celebrate the month of love, Zindagi, the No. 1 Premium Entertainment Channel, brings to you the most successful romantic story from South Korea, ‘Descendants of the Sun’ starting 8th February at 8 PM. Zindagi also announces the ‘Be My Valentine Contest’, where viewers will get a chance to profess their love to their loved ones as part of the Valentine’s Day celebrations. Starting 1st February to 10th February, viewers get a chance to declare their love on National Television, by Tweeting a proposal of love to their loved one to @Zindagi using #ZindagiKehtiHai. The best and most unique proposals will be aired on Zindagi during the new show, ‘Descendants of the Sun’ from 8th Feb to 14th Feb between 8 PM to 9 PM. The story of ‘Descendants of the Sun’ revolves around a Special Force Officer and a surgeon who fall in love at first sight. Their contrasting ideologies and values (as one kills to protect lives while the other one saves lives to protect them) makes them shy away from one another. Destiny plays an interesting role and after almost a year of having parted ways, they meet at a warzone ‘Uruk’, a land far from Seoul. Now, circumstances bring them face to face where they must work closely together driven by their principles. 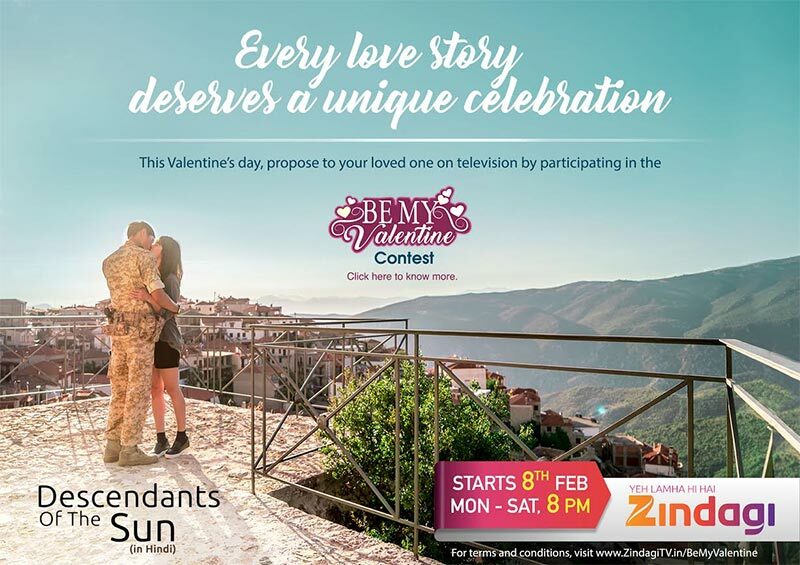 Participate in the ‘Be My Valentine Contest’ and catch the first South Korean Drama – ‘Descendants of the Sun’ in Hindi starting 8th February, every Monday to Saturday at 8 PM, only on Zindagi!!! 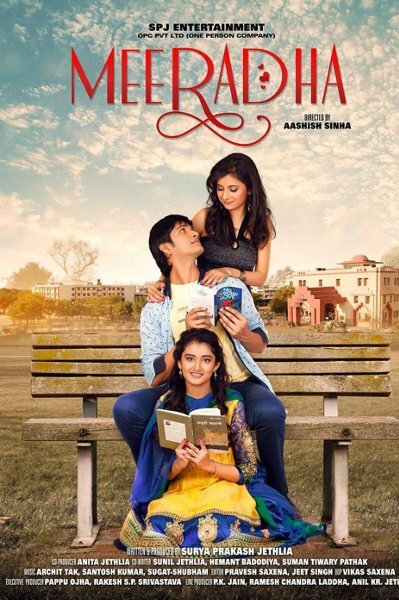 The poster of Himansh Kohli’s forthcoming film Jeena Isi Ka Naam Hai was released with much fanfare. Jeena Isi Ka Naam Hai, as the name suggests, is a film where the characters’ share lives, moments and emotions, which are as raw as any of us. The story embarks from a small-town in Rajasthan, weaving itself through Mumbai & then finally culminating in New York. Each character in the film is as diverse and unique in themselves like the flavours of India, which not only adds different slices of life to the film, but also exhibits the colourful journey of life. With a cast ensemble that boasts of Himansh Kohli, Manjari Fadnis, Arbaaz Khan, Rati Agnihotri, Ashutosh Rana, Supriya Pathak Kapoor and Prem Chopra, the film that has hard-hitting dialogues and a grippingly narrative screenplay is sure to keep the audiences glued to their seats in anticipation of what will happen next in this journey of life. Shot extensively in the beautiful locales of Rajasthan and USA, each frame becomes a visual treat captured especially for the big canvas. The film is set for release on 3rd March 2017. Royal Stag Barrel Select MTV Unplugged season 6 is getting exciting every week with the amazing line-up of artists. This season, witnessed some biggest singers starting with none other than musical maestro A. R Rahman, followed by the melodious voice of Shreya Ghoshal. Last week Benny Dayal and Neeti Mohan's duet performance was incredible, energetic and drove everyone crazy. After three scintillating episodes of Royal Stag Barrel Select MTV Unplugged the season 6 is entering its fourth episode. Being the month of love, the magical composer and singer Sachin-Jigar will sway the audience with their soulful voice. 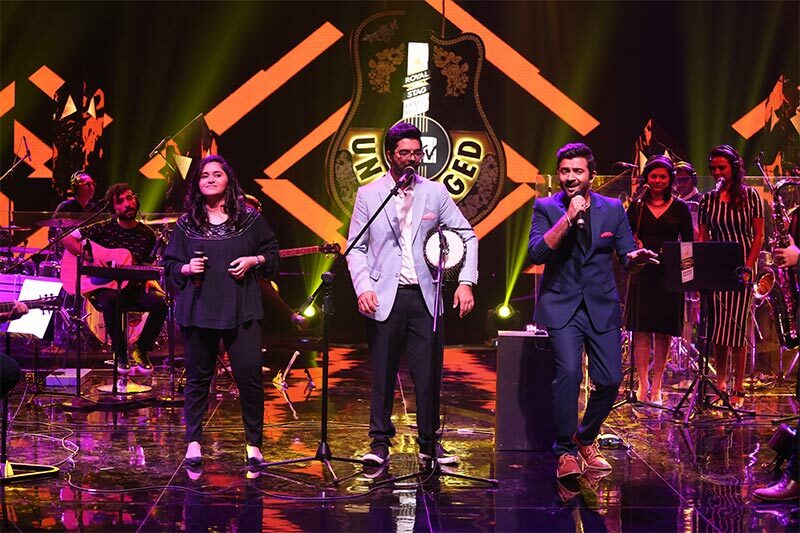 This isn't the first time the duo Sachin-Jigar has been associated with MTV Unplugged. From grooving to crooning on popular dance numbers and some soulful romantic numbers, Sachin–Jigar will make your Saturday evening a memorable one. Sachin-Jigar will sing songs like Jeena Jeena (Badlapur), Chunar, Sun Saathiya (ABCD 2), Mileya Mileya, Beat Pe Booty (Flying Jatt), G-Phad Ke (Happy Ending) and few more. Shedding some light about their association with Royal Stag Barrel Select MTV Unplugged season 6, Sachin says, "I love MTV unplugged every season is simply marvelous we have been part of this show and we love it. While this season is also one of the best with some new comers also performing and I am looking forward to the episodes." Talking about our episode Sachin avers, we are singing our famous songs Jeena Jeena, Sun Saathiya, Mileya Mileya, Beat Pe Booty, G-Phad Ke that too unplugged it has mix of some dance numbers and romantic tracks. Composer Jigar added, "Yes, we are delighted to be part of this season's MTV unplugged and looking forward for some great performers. Like Sachin said we are signing some of our numbers that too with a twist." Tune into Royal Stag Barrel Select MTV Unplugged this Saturday and enjoy Sachin-Jigar perform some breathtaking numbers at 8.00 Pm. Sandesh Gour who was last seen in the Bollywood romantic movie Meeradha in the lead is on cloud 9 these days. 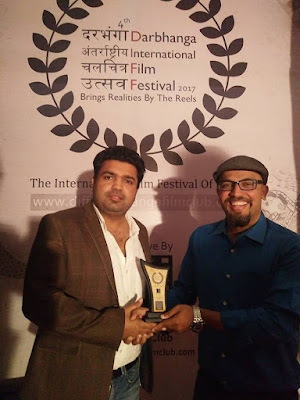 The reason is his debut movie Meeradha got him the Critics Award for Acting in National Category at the recently concluded Darbhanga International Film Festival 2017. This good news comes out of the blue as he was least expecting to win the same and that too in his debut film.